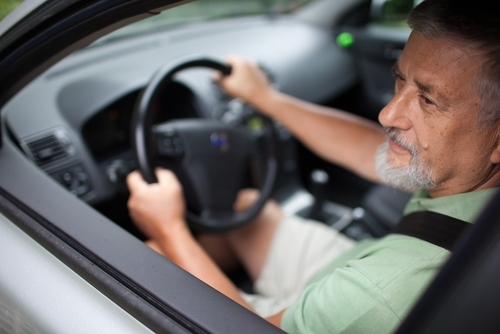 Senior citizens aren’t the people you typically think of as being likely to use their cell phones while driving, an activity that’s flatly banned in 14 states, including the District of Columbia, according to the Governors Highway Safety Association. But contrary to popular belief, it’s these same individuals who admit – in large numbers – to driving distracted behind the wheel, based on a newly released survey. Approximately 60 percent of adults over the age of 65 indicate that they frequently use their handheld devices for either texting or calling while driving, a recent study conducted by the University of California San Diego found. Approximately 400 anonymous seniors took part in the poll. Distracted driving is disturbingly common, evidenced by the tragic toll of people who have died in accidents where multitasking was to blame. In 2015 – the latest year with available data – 3,477 motorists were killed in crashes attributable to distractions, according to the National Highway Traffic Safety Administration. Additionally, roughly 391,000 people were injured. It’s believed that at any given moment during the daylight hours, some 660,000 drivers are on their smartphones in the U.S. overall. As the UC-San Diego poll found, this includes senior citizens, the majority of whom own a smartphone (82 percent). Linda Hill, M.D., professor in the Department of Family Medicine and Public Health at UC San Diego’s School of Medicine, noted how teenagers are typically those first thought of as being prone to drive in a distracted state. However, multitasking is an offense virtually everyone does. What makes this safety hazard more worrisome, the researcher note, is that many seniors have medical conditions that they’re treating due to age-related decline. Thus, they may be taking medications that have side effects, potentially adversely impacting their ability to drive. “There is concern that adding distraction to the reduced skills of some older adults will increase these crash rates even further,” Hill added. After several years of consistent declines, deadly car crashes are occurring at a more regular rate. In 2016, preliminary estimates reveal 40,000 motorists were killed on America’s roadways, according to the National Safety Council. That’s 6 percent more than the previous year and up 14 percent compared to 2014. The NSC is an organization that’s called for a nationwide ban on handheld phone use. The National Transportation Safety Board has recommended similar legislation be passed, which includes making the penalties stiffer. In several states where cell phone restrictions are in place, the outright bans typically apply only to novice drivers, specifically those still in their teen years, according to the GHSA. For texting while driving specifically, however, most states prohibit all motorists from engaging in this behavior, Washington being the first to do so in 2007. Despite motorists’ acknowledgment that texting and driving don’t mix, they continue to do it. Indeed, approximately 60 percent of motorists in a Kelley Blue Book poll done last year admitted to driving distracted, even though they were cognizant of the potential ramifications involved. PayneWest Insurance encourages policyholders to take a stand by putting their phones away whenever they’re behind the wheel. No text message sent or phone call dialed is worth the risk.